Seven years ago, I thought of Texas primarily as an obstacle, a mind-numbingly long stretch of highway between Baltimore, where I was coming from, and Los Angeles, where I was going. I was at a peculiar junction in my life, trying to figure out where I wanted to live. Because most of my work was online, it could’ve been anywhere, and that was intimidating but also liberating. California seemed like the kind of place a young woman trying to make a life for herself might go. When I started driving through the Big Bend region of Texas, I quickly revised my opinion about a state I had previously dismissed. The sky in far West Texas astonished me. Not just because of its beauty—though that was certainly a factor—but, even more so, because of its volume. As a person who’d spent the bulk of my life on the East Coast, with its gentle, tree-covered hills, I remember being shocked that there was just so much of it. It was, frankly, confusing. Was there somehow … more sky out here? That didn’t seem physically possible—so where were they hoarding it back east? And why had it been kept from me this whole time? After six months in L.A., I decided it wasn’t what I had imagined—like so many others, the clamor and the traffic defeated me. I crammed all my worldly possessions in the back seat of my Volvo, coerced my irritated cats into a crate, and made the drive back to West Texas. The prospect of seeing that sky every day was intoxicating. Soon after I moved to Marfa, a new friend insisted on taking me to Big Bend National Park. We bought a few jugs of water in Alpine and pointed the car south. We drove through miles of fenced openness, ranchland that looked too parched to support a cow. Mesas rose up in the distance, testifying to some long-ago geological drama. The huge, blue sky discomfited me; I still wasn’t used to it. After an hour, the road climbed upward, through hills that seemed, mysteriously, to sparkle. And then there it was, unfolding in front of me, in all its dramatic, austere beauty: the Big Bend. In October 1899, a 31-year-old man named Robert T. Hill set off on an exploration of the canyons of the Big Bend for the U.S. Geological Survey. Born in Nashville and orphaned by the Civil War by the time he turned 5, Hill was raised by his grandmother, a strict Methodist, who attempted to instill a sense of discipline in the boy. Alas, “He soon developed the rebellious independence that characterized his life,” according to the Texas State Historical Association, and spent his young adulthood roaming, working as a printer’s devil, a cowboy on the Dodge City Trail, a newspaperman, and eventually a Cornell-trained geologist. Hill’s initial impression of the Big Bend region was largely marked by complaints. The shrubby plants horrified him “as strange and unfamiliar as the names they bear.” He found the local vegetation most notable for its thorns: “You are wounded, caught, held, or anchored by this spiteful vegetation at every step.” The climate, too, was wanting: “One is also roasted unmercifully by day by 130 degrees of sunshine, and cooled almost to the freezing point at night.” According to Hill, the Big Bend area was also called the “Bloody Bend,” a term I’ve heard nowhere else. More than the physical hardships, what seemed to trouble Hill most was how little he understood the place he was proposing to explore. The Big Bend, Hill noted, was “weird and strange,” with every aspect—“landscape, configuration, rocks, and vegetation … of a type unfamiliar to the inhabitants of civilized lands.” The area was so unrecognizable that it stunted the stranger’s vocabulary, even one as voluble as Hill’s. “There is no natural feature that can be described in familiar words,” he wrote. I came to West Texas in order to write, although I didn’t admit this to anyone, and barely even to myself. It sounded too grandiose to say out loud—and besides, what if I failed? Instead, I told everyone I had been on a road trip passing through, and the landscape had snagged me and wouldn’t let go, like one of those spiteful cacti Hill wrote about. I spent my first few weeks orienting myself, getting a post office box, figuring out how to live in a town where you couldn’t buy kale or get a prescription filled. (Marfa has changed quite a bit even over the six years I’ve lived here; now you can easily obtain both.) After I’d taken care of all the mundane tasks, the reality of my new home settled on me with a surprising heaviness. What had I done? What was this strange place? When the need to escape felt too strong to ignore, I made the 150-mile drive down to Big Bend. Something about being behind the wheel soothed me; when I was on the move, I didn’t have to think about where I was. Down in the park, the void multiplied—the landscape was sere, unforgiving. The road passed by craggy outcroppings studded with prickly pear cacti. In the lowland areas, the dominant plant was ocotillo, which looked to me like seaweed born on Mars. I drove for miles without seeing anyone else. It startled me to see another vehicle’s headlights on the road. It felt almost like an affront. If town seemed unfamiliar and forbidding, Big Bend was all that—but intensified. Its emptiness left me with a roving anxiety I couldn’t quite put my finger on. It wasn’t that I was afraid of nature. Quite the opposite, actually. I grew up hiking. When my brothers were old enough, my parents would take us all on multiday camping trips, loading our equipment into two canoes and paddling through the aptly named Bog River in upstate New York. I’d gone on backpacking trips on multiple continents. Still, there was something about Big Bend that unnerved me, even as it kept drawing me back. Part of it was the sheer inhospitality of my new home. When I’d gone hiking back east, I could always console myself with the idea that, if I ever got hopelessly lost in the woods, I could theoretically find a way to survive: seek out a creek, pond, or a river to drink from; forage for edible plants; build a shelter out of tree limbs. But it was apparent right from the outset that if I ever had the misfortune of finding myself lost in Big Bend, I would be toast. One bright day that winter, I decided to try the Lower Burro Mesa Pouroff trail, a hike the guidebook assured me was relatively easy and might, if the conditions were right, lead to a waterfall. As I walked down the dry creek bed, I tried to imagine water abundant enough to cascade, or even trickle. It was impossible. The ground looked parched. Even some of the prickly pear cacti were shriveling up. Sure enough, the trail petered out at a rocky area blocked off by a high rock wall. There was no waterfall, much less water, to be seen. On the way back, I tried to ignore the blisters I felt forming on my pinkie toes. I was less than a mile from my car. When I scanned the landscape, I didn’t see anything that seemed like serviceable food or shelter. I wasn’t lost, and I had plenty of water—but still, I couldn’t shake the sense that peril was very close at hand. I made it back to my car without incident. Of course I did; my anxieties were more existential than practical. I didn’t yet know about Hill’s trip down the Rio Grande, but I was feeling a similar sense of unease. 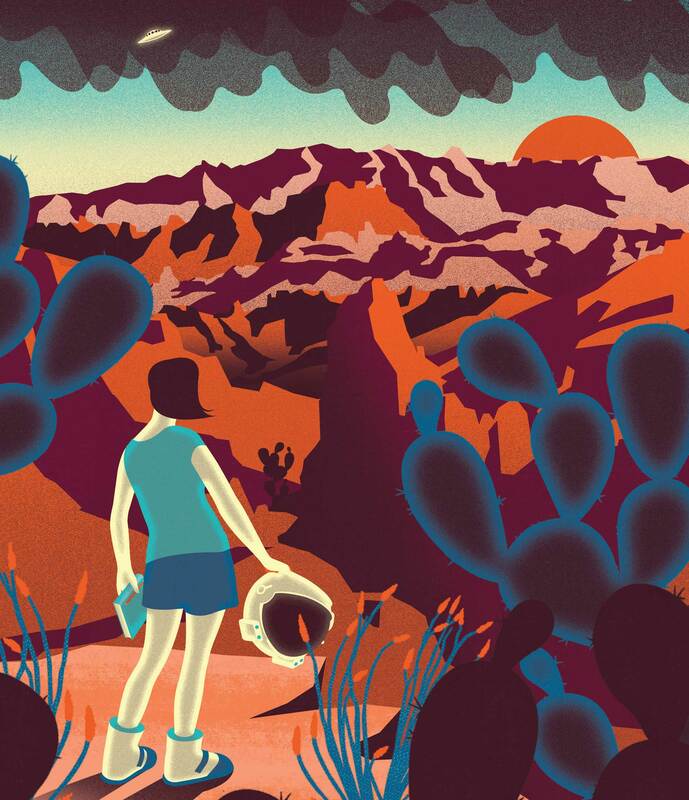 It turns out those wide West Texas skies either make you feel free—or exposed. In the wrong mood, openness can also feel like emptiness. And of course, nothing is more frightening to a writer than a big, blank space. But maybe all it takes to feel at home in a place is to get in sync with its rhythms. A year after my first visit, I returned to Big Bend. That spring, I was finally starting to feel less out-of-sorts—in part because I began to realize the desert wasn’t as seasonless as I’d previously assumed. The changing seasons just announced themselves in ways I wasn’t accustomed to. In Big Bend, the cacti revealed their flowers, and the park hummed with the sounds of awakened insects. I had just learned the word for the sweet, earthy scent that perfumed the air after a rainstorm: petrichor. The desert grew lush in its own way, I was discovering—and, far from being empty, actually thrummed with life. I realized I had been making some classically American blunders: mistaking unfamiliarity for threat and experiencing things I didn’t know the names of and assuming they had no names. I also began to discover the tightknit human communities that lived in and around Big Bend. I was drawn to the storytellers. At the Starlight Theatre in Terlingua, I befriended the park’s former archaeologist, Tom Alex, and his wife, Betty, a biologist, two people who knew the history of my new home better than anyone else I’d met. I listened raptly to accounts of 1970s-era antics from Mimi Webb Miller, proprietor of La Posada Milagro and Big Bend enthusiast. The region is so distant from any major city that it, by necessity, takes a crowd— concessionaires, river rangers, schoolteachers, and geologists—to tend to it. At Panther Junction, the beating heart of park operations, I discovered the behind-the-scenes world that kept the park humming along for visitors: housing for about 100 park employees and their families, as well as a school for their children, a Border Patrol office, and a pen containing the good-natured mules who lug food and supplies up the trail when crews are working deep in the backcountry. Through my new park friends, I also began to learn about the history of this rugged, demanding place. For nearly 10,000 years, people have found ingenious ways to live in this supposed “land of despair.” The indigenous history of Texas was visible in Big Bend once I knew how to look: in the eerie pictographs at the hot springs on the edge of the Rio Grande, in the remnants of stone tools discovered within the park’s boundaries. I tagged along with Mimi, Tom, Betty, and a handful of others on a trip to Big Bend’s counterpart in Mexico, the northern edge of the province of Coahuila. We bumped along unpaved roads and listened to Mimi’s wild stories. After we passed a faded old pickup heading in the other direction, Mimi slammed on the brakes. I craned my neck to see that the other truck had stopped in the middle of the road, too. The driver turned out to be an old friend she hadn’t seen in decades. He leapt out of the cab to hug her. Then, a few miles down the road, the same thing happened again. Relationships persist out in the desert. What you can’t get from the landscape, you have to get from one another. The Hill expedition set out from Presidio at noon on Oct. 5, 1899. The six men hoped to navigate down the Rio Grande, taking note of the peculiar geology of the place and mapping a course for subsequent travelers to follow. The journey wasn’t easy. Hill fretted about the water suddenly rising at an inopportune moment, when it might smash their boats against the rocks and leave them stranded. The men carried the boats around unnavigable rapids. They felt claustrophobic in the shut-in canyons, where the sheer basalt walls stretched hundreds of feet overhead. They kept their guns close at hand. But slowly, over the course of the river trip, Hill seems to have relaxed, even formed a crush. His complaints give way to more precise, affectionate descriptions. What had once seemed like the menacing chaos of the desert began to reveal itself as full of subtle colors and hidden signs of life. On a full-moon night, the men rowed in the dark, and Hill gloried in the strangeness of the moonlight. “Slowly this brilliant light sank into the magma of darkness, which filled the canon, gently settling from stratum to stratum as the black shadows fled before it, until finally it reached the silent but rapid waters of the river, which became a belt of silver. Language cannot describe the beauty of such nights,” he wrote in his journal. Earlier in his trip, Hill had associated speechlessness with fear. A hundred miles downriver, he had discovered that the indescribable could also be a source of wonder. I’ve now spent more than six years living in this difficult, lovely place. These days, pronghorns and mesquite feel like home—but I had still never taken my own version of a Rio Grande expedition. This past July, three friends and I decided to remedy that by spending a couple of days on the river. A park ranger friend arranged for us to borrow some canoes, which we loaded down with tents and big coolers of beer and LaCroix. It was exactly the wrong time to be on the river—“low water, high temperatures,” as one local skeptic put it—but that only made it more of an adventure. We shielded ourselves with huge hats and dipped burlap sacks in the river, draping them over the coolers as a kind of ad-hoc air-conditioner. Sure, we spent less time paddling and more time dragging our boats behind us through two-inch deep water, but we had the river all to ourselves. According to some news reports at the time, the whole border region was fraught with violence and strife, but I sure didn’t see any. Truthfully, it felt like an enormous privilege to be able to drift from one bank of the river to the other, sometimes forgetting which country we were technically in. In a region bound together by geology and history and a shared willingness to make a go of it in the desert, the two banks of the river felt more alike than different. At our campsite that night, I thought about Hill, the catalyst for my river adventure. After he returned from his trip down the Rio Grande, he went on to have a long and richly rewarded career as a geologist. Over the next four decades, he mapped and named many of the state’s key geological features—the Balcones Fault, the Trans-Pecos region—and he became known as the father of Texas geology. But I can’t help but wonder if he, like me, ever got nostalgic for his first rough days in the Big Bend, when he was immersed in a world so unfamiliar to him that his capacity for language couldn’t keep up—that period before he knew the names of things. I, too, am grateful the desert no longer intimidates me, but I also look forward to the moments when it fills me with a sense of awe: a thundercloud over the Davis Mountains, the way the landscape responds to rain, a family of javelinas snuffling in the prickly pears, an awesomely psychedelic sunset. Even if I stay here for years, I hope the Big Bend remains at least a little strange to me, its beauty hovering at the edge of what words are able to say.